Just because you have a small room doesn’t mean it needs to feel small. 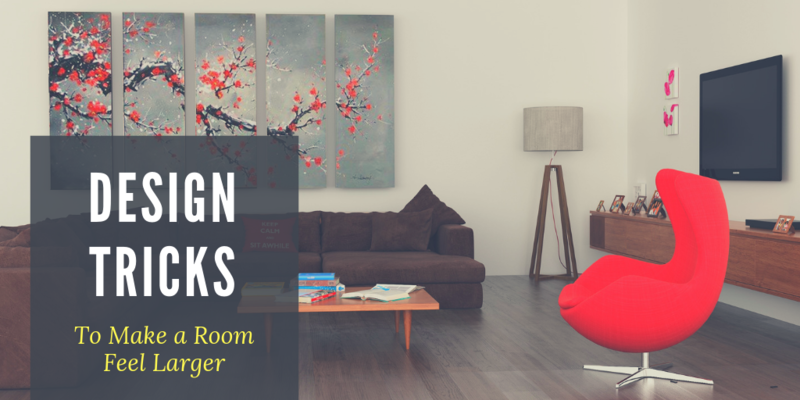 There are several design tricks to make a room feel larger, brighter, and more inviting. Here are a few that might help with your small space. You’ve probably heard that using light colored paint can make a room feel larger. There’s actually another trick that involves bold colors, which is great if you’ve been dying to go with something less neutral. Adding a darker color to one accent wall in your room can add depth. Thus, it makes the room feel deeper than it might actually be. The key is to select the right wall. Usually, it would not be the wall with the door entering the room. It might not be the wall with a ton of windows either. Stand in the room and consider which wall and direction of the room would benefit most from added depth perception. Another great trick to make your room feel larger is to use consistent flooring. This applies to both the specific room and the transition from the room to other spaces in your home. Consistent flooring allows the eye to continue on past the room rather than being constrained by it. This gives the illusion of more space. For instance, a room with an area rug will feel smaller than a room with visible hardwood flooring throughout. Visible flooring is also important for furniture. Select furniture with feet so that flooring is visible underneath. 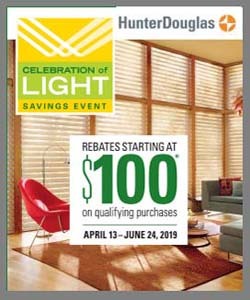 This extends the visual space and makes the room feel larger. It also makes it easier to sweep or vacuum! 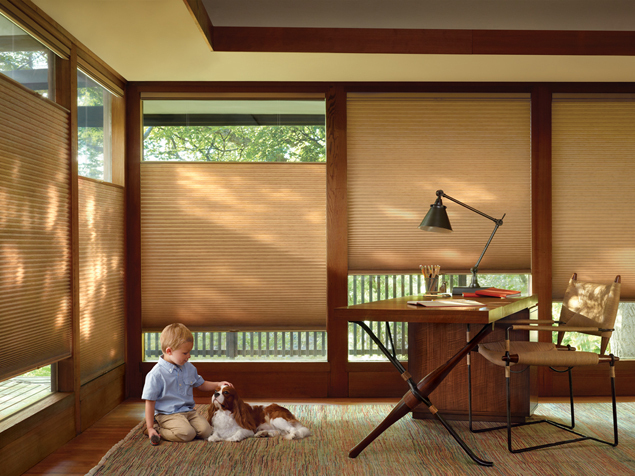 The last of our design tricks to make a room feel larger involves the window treatments. 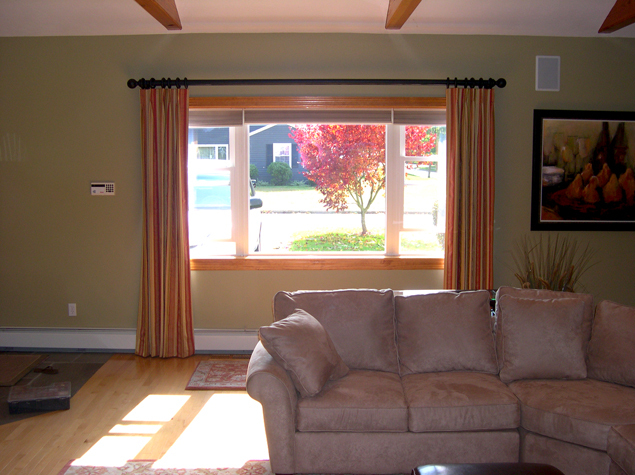 Window treatments that allow light to enter your home while still maintaining privacy make your room feel brighter and larger. Lighter shades of color and weight of fabric are also helpful. As you can see from the list above, there are many different ways to approach your room decor that influence the perception of space and size of a room. With the right combination of tricks, your room can be welcoming and comfortable while still feeling spacious for its size. 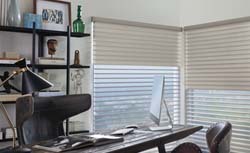 If you’d like help with designing your space or selecting window treatments, visit us at our Burlington MA showroom and design center. 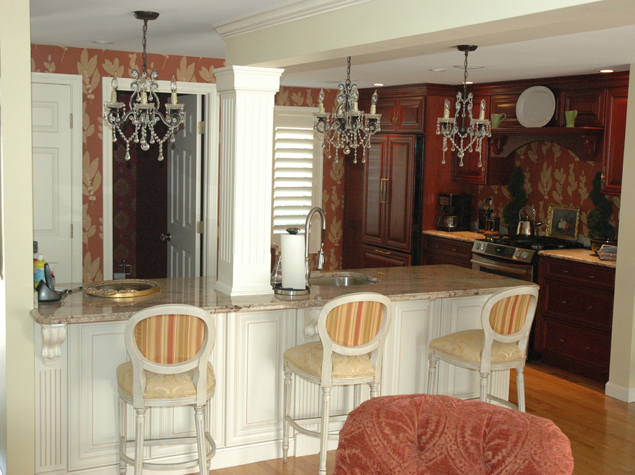 We can help with anything from flooring to decor, custom furniture, and window treatments.